"Hi, Sarah. We have your cookies. Call us at 867-5309." Yes, it's one of the three signs of spring: crocuses, robins, and ransom notes from Girl Scouts. They made me an offer I couldn't refuse... THIN MINTS! These cookies are a memory food for me -- you know, one of those foods that brings a whole string of associated memories. Girl Scout cookies remind me of being in the Girl Scouts and of camping. I was a Brownie in elementary school, and our biggest activity was the annual camping trip. S'mores. Sit-upons. Scavenger breakfasts... I'm sure other troops actually scavenged through the forest for breakfast, but our version of scavenger breakfast was to search for little cereal boxes that the grown-ups had hidden in the trees. The coup was finding the box of Fruit Loops. Fruit Loops carry their own set of memories. 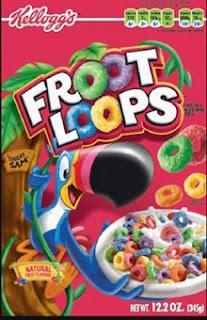 Growing up we weren't allowed to have any cereal where the first ingredient was sugar, so that meant Fruit Loops were right out since sugar is pretty much the first, second, third, fourth, and fifth ingredient. So of course in college, I ate Fruit Loops at nearly every meal. Yes, I was quite the rebel. Other big memory foods for me are fresh raspberries (we used to have a raspberry patch in our backyard) and havarti cheese melted on pita bread (my mom used to make it as a special snack or party appetizer). What are your memory foods? 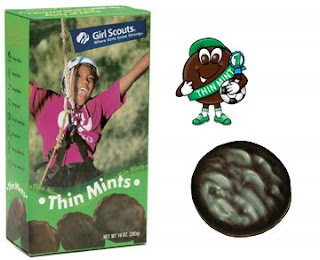 I'm happy to say that I paid the ransom and now have my three boxes of thin mints. So now it's officially spring. Not in an I-want-to-meet-him kind of way. He likes to eat people; I don't like being eaten. We wouldn't be a match. But his story is one of my favorite obscure fairy tales. It's from a collection of Norse tales originally collected by Asbjornsen and Moe and translated by Sir George Webbe Dasent. Once upon a time... a king and queen want a child. A nice witch tells the queen to place a cup upside down in her garden. By morning, a red rose and a white rose will grow. I love how simple this fertility rite is. No magic potions. No special words. Just an upside down cup. It's so simple that you almost feel like the queen should say, "Oh, of course! An upside down cup! Why didn't I think of that? Silly me, I'll toss out my lingerie and ovulation charts and go find me a cup." If she eats the red rose, she'll have a boy, the witch tells her. If she eats the white rose, she'll have a girl. "But whatever you do," the witch says, "don't eat both roses!" Simple instructions. Simple warning. What could possibly go wrong? The queen obeys. In the morning, she eats the red rose. It's so tasty that she eats the white rose too. Really? Because it's "tasty"? Did you not take Fairy Tale 101? Don't eat the poisoned delectables, don't diss the talking animals, and never ever disobey the crazy old woman doling out unsolicited and nonsensical advice. Nine months later, she gives birth to a boy. She also gives birth to a super-scary serpent thing, but it scuttles away quickly and she convinces herself she imagined it. I wonder what the midwife said. I'm guessing, "AHHHHHHH!!!!" Years pass, the prince grows up and decides to marry. He rides away from his castle to find a princess, but at the first crossroads, a giant lindworm (a.k.a. a super-scary serpent thing) blocks his path. The lindworm says, "A bride for me before a bride for you!" I can't help but wonder: What's the lindworm's life been like up until now? Who raised him? Where does he live? Has anyone been making sure he brushes his teeth and eats his veggies? Last thing anyone wants is a serpent with bad breath and scurvy. He tries another path. The lindworm appears again. Every road he tries, he encounters the lindworm. He finally returns to the castle. Interesting that he doesn't try to slay the dragon/serpent/whatever. Isn't that in the fairy-tale prince manual? The queen tells him that yes, that super-scary serpent thing really is his big brother and should be married before him. That conversation must have been AWKWARD. So the king sends letters to distant kingdoms asking for a bride for his son. A faraway kingdom sends a princess. She is not allowed to see her groom (the lindworm, of course) until after the wedding. I can't help picturing a wedding reception with a giant serpent. He'd be fine at the Electric Slide or the limbo, but they'd have to skip YMCA and the macarena. The next morning, the princess is gone, and it's obvious that the lindworm has eaten her. Obvious how? Wait, don't answer that. I don't want to know. The second son tries again to leave in search of a bride, but the lindworm again stops him. The king summons a second princess. The new princess marries the lindworm. By morning, she's been eaten. I know we know nothing about the lindworm's upbringing, but perhaps someone should let him know this is not acceptable behavior. Big brother lindworm needs to go to his naughty spot. By now, no king anywhere will send his daughter. So the king forces a poor shepherd to give up his daughter to be the lindworm's bride. What exactly is the king's strategy here? Keep offering up girls until the lindworm no longer feels peckish? Methinks that the king's plan has a few tiny flaws. The poor girl is distraught. She wanders around crying until she meets the nice witch. The nice witch tells her to request ten white dresses, a tub of lye, a tub of milk, and a lot of whips. When the lindworm orders her to disrobe, the witch tells her, she must order him to slough a skin. She is to repeat this until all the skins are gone, then whip him with whips dipped in lye and wash him with milk. Lastly, she must hold him in her arms. Let's hope that's not a euphemism. "Ugh," the girl says, "do I really have to hold him?" She's hoping it's not a euphemism too. "Yes," the witch says, "you really do." Still hoping for no euphemism. After the wedding, the poor girl follows the witch's orders. When the lindworm tells her to disrobe, she orders him to shed a skin. He's surprised but obeys. She follows the witch's instructions perfectly, ending with dragging him to bed. Oh, crap, I think it's a euphemism. In the morning, when the king peeps into the bedchamber, the girl is alive and well. Moreover, there's a handsome prince lying beside her. Sure, he ate two princesses earlier this week, but he's so pretty now, who could hold a grudge? Everyone is so happy that they hold a second wedding reception, and the king and queen treat their new daughter-in-law with love and kindness for the rest of their long and happy lives. Now we get a proper macarena! And loving in-laws. That's what I call a happy happily-ever-after!